Winter has finally arrived in Paris, so with arms tangled and hair highly mussed, let’s stroll to my favorite pâtisserie and rendezvous hotspot. I am in the mood for some warm, flaky goodies, so hold on tight while I straighten your trench coat collar. Love is in the air. Follow my lead. Envelope, please! The amiable boulanger scored a shiny medal, cash, and the honor of baking bread for President Nicolas Sarkozy and First Lady Carla Bruno-Sarkozy at the Palais de l’Elysées (the French presidential palace) for one year. Here’s the scoop: The annual award is based on aroma, texture, crust, and size. And yes, Virginia, size DOES matter, at least when it come to bread—this year 32 of the 175 competing baguettes got eliminated because, well, they came up a tad on the short side. Here’s another tidbit. 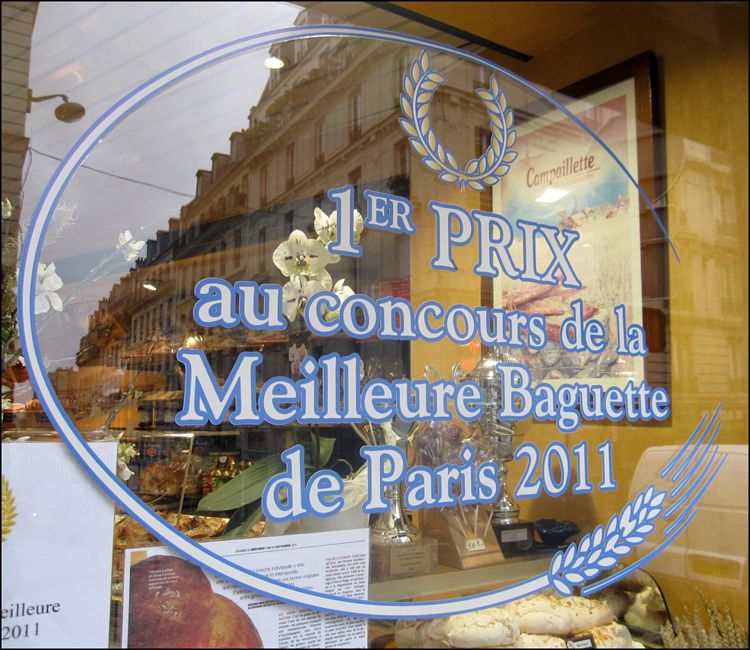 In the past five years, four boulangeries in Montmartre have won the coveted award. Could it be that there’s something special about the old hill’s own local earth, wind and fire! I highly recommend Monsieur Barillon’s pain au chocolat. Tip: Every blue moon, the ladies that run this shop can be a tad crabby. But don’t take it personally. Just rise to the occasion, and savor each chocolate morsel and flake like there’s no tomorrow! Then, with your Levain d’Antan sweets in hand, sashay on over to the nearby “J’taime Wall,” located by the Hector Guimard entrance to Metro Abbesses. 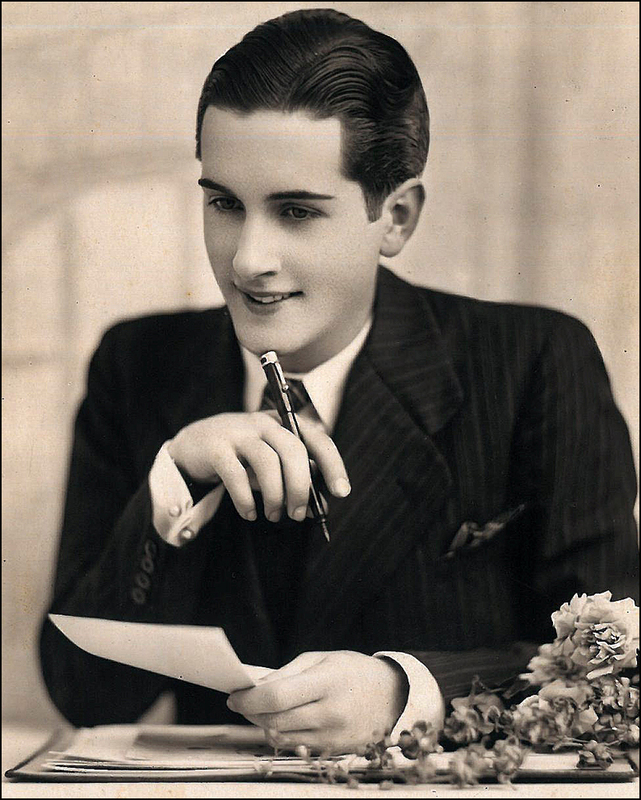 Pack a hanky! It’s never failed to move me to tears. 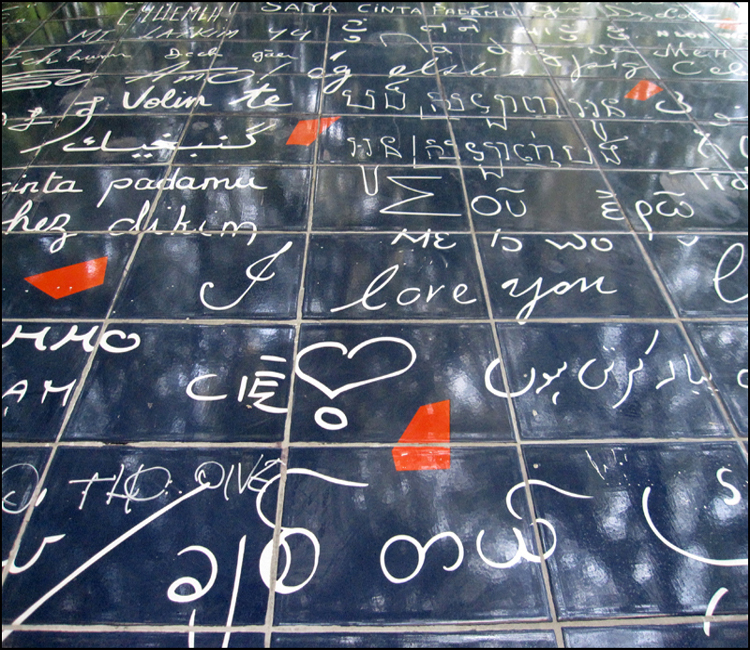 Created by Frederic Baron and Claire Kito, the phrase “I Love You” in 250 languages is inscribed on glazed blue tiles.Take heed: After your visit, you might even commit a few acts of random kindness! Life is groovy. putting this place on my list to visit! can’t wait! DGL! Yes, add it to your list! Le Coquelicot (“The Poppy”) is located just one block away from Au Levain d’Antan at 24 rue des Abbesses (on the other side of the Abbesses Métro station and the “I Love You” wall. Here’s where I buy my ham and cheese sandwiches, along with their snazzy, signature “Piccola” baguettes. 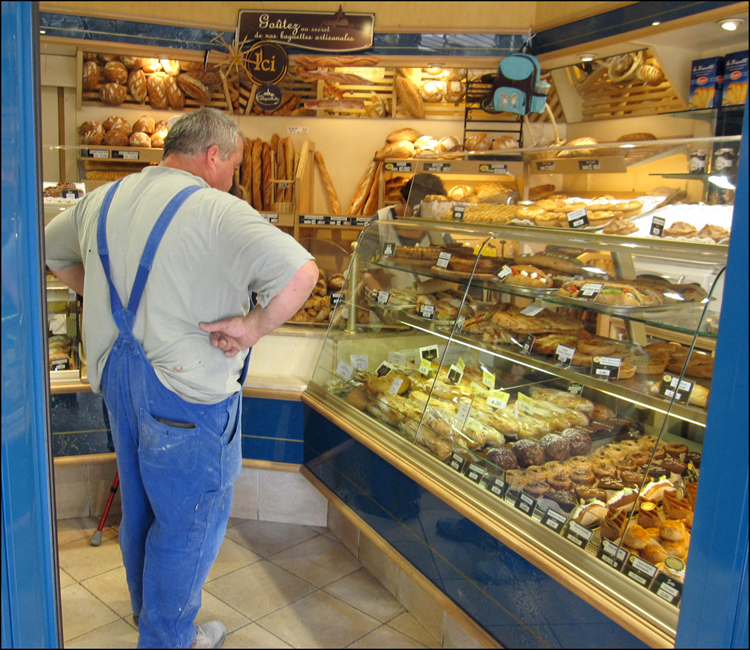 (They now sell a super-sized baguette! Dangerous to my hips!) It’s the perfect breakfast spot. Perks include a fabulous view of the bakers kneading! And they are lookers! I’d love to be at this patisserie every morning. I love French croissants that when we were camping there while I was pregnant with my daughter, I can finish 3-4 every morning. Your croissants are just heavenly! J’ai faim maintenant…tout suite, les chocolats! Ah, c’est meilleur, n’est ce pas? Love your blog, I take a little trip to Paris every morning for breakfast …. Who can possible resist a fresh pain au chocolat! Thanks for visiting my blog! LOVE yours. Paris is one of my favorite cities to visit! I’ll have to refer back to your posts the next time I go so I can hit up all the fabulous places to eat/shop/wander. Fabuleux!! I looove pain au chocolat! Looks divine! Thanks for you comments on my blog. I enjoy looking at your photos and reading your blogs. 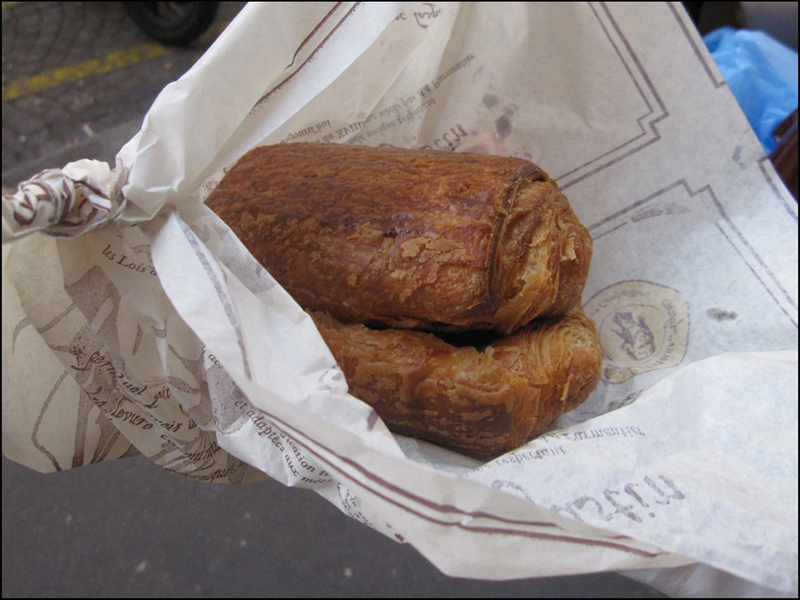 And, I sure miss the pain au chocolat from when I was in Paris. I had one with coffee in the morning and I’d have to have another one in the afternoon. Good one ! Pain au chocolat is one of my favourites and we get it here in UK ! Maybe not as good as in Paris 😉 I love to have them with my coffee !! Absolutely delicious, and love your blog. Thank you so much for stopping by mine, and hope to see you again in the future. Theo, do you have an email address? How can I get ahold of you? Hi Kyla, Here’s my addresses: theadora . brack @ gmail . com . Enjoy the weekend! T.